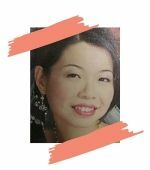 When I set up my very first website, I spent two whole days and nights mulling over the domain name. I shortlisted 3 to 4 of the best website domain names, in my opinion, and asked family and friends for their polls. Am I glad to have devoted time and thought to choosing my domain name, something that will become my branding, and will stick with my website for the years to come. Always think long term when you are deciding on your domain name, because if you change it down the road, your SEO ranking is going to get hit, your marketing efforts have to increase to hang on to the audience whom you have built up a relationship with, as they will not recognise your new name, so will need time to adjust. In technical terms, a domain name is simply the internet address of your website. There are two parts to every domain name: second level domain (SLD) and top level domain (TLD). These days, you can choose from any of the TLD that is available on the domain name registrars, the common ones being .com, .net, and .org. What you cannot choose from are: .gov and .edu. For SLD, anything goes, as long as it is available (has not been bought by anyone). The SLD can contain any number of alphanumeric characters, hyphens are allowed if surrounded by alphanumeric characters. Spaces are not allowed. But in human terms, and marketing terms, it really begs more than that simple definition. Your domain name, if chosen well, is prime estate in the internet space. It is where the crowd and the buzz is, right in the middle of the city, in plain sight of the people milling through the sidewalks. 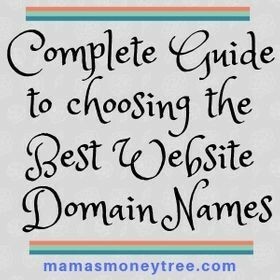 We are now going to look at the factors that decide which are the best website domain names, and how you can go about carving one for yourself. The reasons are simple. It is the most prestigious. It is the most well-known. When people type in the domain name in trying to locate a website, they usually remember only the SLD, and assume the TLD is .com. So if yours is not .com, there is a very high chance that you may lose your traffic and customers to the website that has the same SLD as you, but on a .com TLD. The exception to this rule is if you are running your business locally, and only targetting your country’s local market, then it is acceptable strategically to go for the TLD that represents your country, like .uk for the UK, .ca for Canada, .it for Italy, .cn for China, .in for India, etc. Your SLD becomes your brand. You want people to remember it, so that they keep coming back to your website, simply by typing it in the address bar of their internet browser, and the cookie will show your website if they have visited it before, making it easy for them to return. Keep it short and simple. Apple, Yahoo!, YouTube, Google, these are such easy names to remember, and yet have nothing to do with their niche. Or you can have a name that is niche-related, which is my own preference. The thing is, it has to be unique, and not just some old-fashioned generic name for the niche, as that will be difficult to build a brand around. But always remember to keep it short and concise, and leave no room for mis-spelling. Single ‘t’ or double, single ‘s’ or double, if people type it wrongly because of such spelling issues, then you again risk losing your traffic to another website. Test it out by saying your domain name and getting family and friends around you to spell it out. If more than a handful have any difficulty, you should not use that domain name. Do not use hypens in your SLD just so you can use a .com TLD, as it is cumbersome to type them out, and it just feels less professional. I like to use namemesh.com just to check for the availiability of the domain names I have chosen, as it also generates for you some fun and unique names that are related to the one you have chosen. For instance, if I try the keyword ‘back pain’, it would generate a whole list of suggested domain names that are available for me to choose from. They are even broken down into various categories, including ‘SEO’ and ‘fun’. 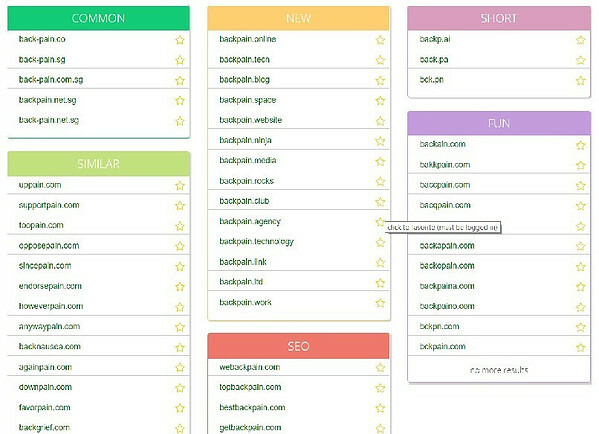 If I do not like any domain name from the entire list, I would then try again with another keyword. This makes the brainstorming process easier, as information on availability is ready at a click, and there are lots of suggestions to pick your brain. I will be posting separately on choosing the best domain name registrars, but common sense would tell us to pick the most trustworthy and established companies, as we don’t want any trouble with our domain name after having spent years building up our brand. That would wash quite a lot of effort down the drain. This next point is ultra important. After you have bought your domain, please please do set it to auto-renew! Domain names are good for 1 to 2 years, depending on your contract with the registrar. If you do not set it to auto-renew, then you risk having someone who has been eyeing your domain to come in right on the expiry date to buy it off. The mere thought of this sends me into a panick. I have seen it happening to people before, don’t let it happen to you. It is worthwhile to give the time and thought in shortlisting the best website domain names for your blog or business, and finally deciding upon your favourite one. 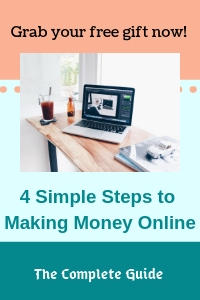 As you are going to build your brand around it, it is a big factor in how easy your marketing efforts will be, especially if people can easily remember your domain name. All the best in choosing your domain name, and have fun while at it!